This oven-baked pasta casserole is full of Tex-Mex flavour. 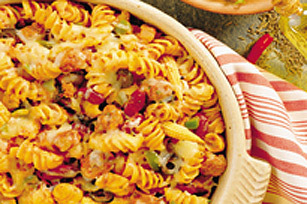 Italian sausage, veggies, tomato sauce and pasta are spiced just right with chili powder and cumin - you can't go wrong with this cheesy pasta casserole! Brown sausage, onion, pepper and garlic in large frypan over medium heat. Stir in spices and pasta sauce. Bring to boil, reduce heat and simmer 15 minutes. Cook pasta according to package directions, drain and rinse. Toss with sausage mixture, 3/4 cups cheese, olives, corn and beans. Spoon into casserole dish and sprinkle with remaining cheese. Cover and bake at 350°F for 10 minutes. Use canned, frozen or fresh corn kernels in place of baby corn.